The Pressnitztalbahn (Press), a private rail operator from Germany, operates two modern EuroRunner locomotives built by Siemens in 2004 and 2005. These two engines are painted blue and carry the Press service numbers 253 014-8 and 253 015-9. 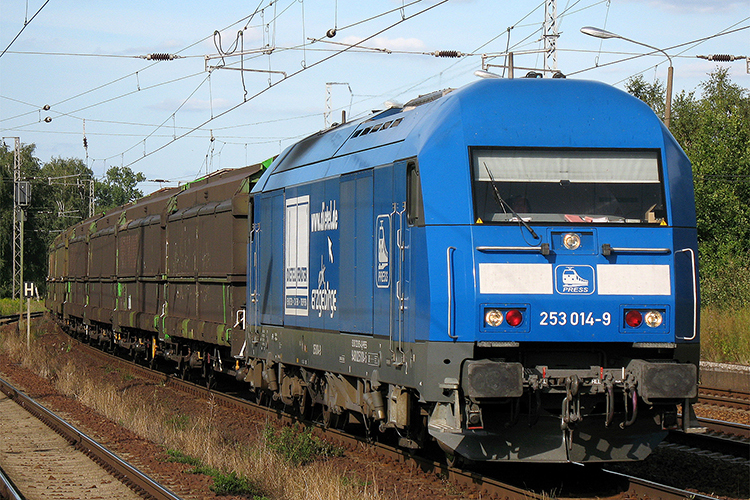 Both locomotives represent the ER 20 BF subtype, which means they are equiped for freight services only. This implies that they lack a passenger train heating system and have an increased fuel tank volume. The locos are used for freight services of both the Press and (formerly) the Regentalbahn. Before the Press started services with its own blue EuroRunners, its staff could get used to the new generation of diesel-electric locomotives. For this purpose ÖBB 2016 072 was hired in April and May 2004. At 23.06.2004, the first German EuroRunner started its career, operated by private operator Pressnitztalbahn (Press). The blue painted machine was numbered 253 014. At that time ‘253’ was the general designation for these machines in the German numbering system. In the meantime this has been changed to ‘223’. However, the Press machines still have service numbers starting with 253, followed by a number indicating the place of the machine in the fleet of the Press. 253 014 and 015 are the 14th and 15th machine purchased by the Press. 253 014 was also the first EuroRunner that was delivered without equipment for supplying power to passenger trains (trainheating/Zugsammelschiene). Also a fuel operated Webasto pre-heater is used instead of the electrical pre-heaters in for example the OBB 2016 series. When the first machine was ordered, an option was taken for a second one. This option was exercised and in March 2005 the 253 015 was delivered. Both machines initially received promotional inscriptions for Dietel Bauelemente GmbH and cooperative partner Regental Cargo. In 2011 new logos were applied instead of the Regental Cargo logos: 253 014 got Pressnitztalbahn inscriptions and 253 015 got promotional inscriptions for "Rasender Roland".